One has to keep in mind when viewing the Camp Blood series that they are by no means big budget, theatrical released films, but low-budget, direct-to-video films that are geared toward a specific sub-group of horror fans....those who will watch anything horror, no matter its budget or production values. Lord knows that this series lack both. 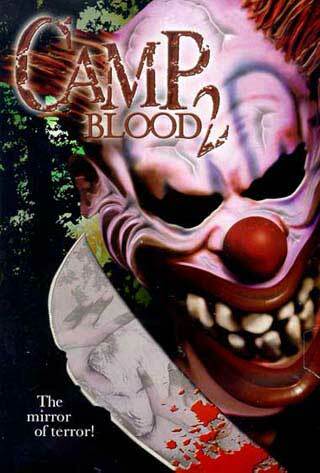 Borrowing elements from "Friday the 13th", "Scream", and numerous other slasher films, the Camp Blood series focuses on a mad killer in a downright creepy clown mask who terrorizes Camp Blackwoods. The first was mildly entertaining, due to the characters and the surprisingly ambitious performance (well, I thought so anyway) by the lead actress (Jennifer Ritchkoff), who returns for Part 2. Suspected of murdering her friends in the first film, a money-hungry independent film maker talks her into being his "technical assistant" on the set of his VERY low-budget take on the murders. To top it off, he wants to return to the same spot, Camp Blackwood, where her friends were butchered. Well, needless to say, the clown returns to wreak havoc on the film crew. The murders in this film will please any gore fan...they are very over the top and extremely gory and there are some interesting characters. It's fast paced, and if you can get past just how poor the production values are, you might actually enjoy it. Again, Ritchkoff as Tricia gives a decent performance and best of all some of the more annoying characters are dispatched in gruesome ways. Overall, "Camp Blood 2" is better than the first. The pace is faster, there are more kills, the clown is creepier and more unrelenting this time around, and the premise, as flawed and ridiculous as it is, doesn't seem like a clichéd "Friday the 13th" rip-off like the first one did. But please take my positive comments on this film to mean it is a cinematic masterpiece. It is far from it. It is just decent for what it is...an EXTREMELY low-budget, independent, direct-to-video horror film. The plot is ridiculous and unbelievable, which is the film's biggest problem...yeah, let's take a suspected murdered back to the woods where she apparently butchered her friends and let her roam around to give her filmmaking insights. I mean, seriously. The production values will immediately turn many viewers off immediately. The ending is hokey and somewhat disappointing for several reasons that I won't get into because of spoilers. But I try to be objective with any film that I watch and it is always a good thing when there is no point in the film where I want to turn it off. "Camp Blood 2" kept my interest and, even with the same director, managed to be better than the first. That is always a plus. If you plan to check this out, however, please remember...it's low budget as can be and do not go in expecting to see "Scream" or "Hostel" like production values! You will be sorely disappointed!